Carleton Watkins (1829–1916) is widely considered the greatest American photographer of the nineteenth century and arguably the most influential artist of his era. He is best known for his pictures of Yosemite Valley and the nearby Mariposa Grove of giant sequoias. Watkins made his first trip to Yosemite Valley and Mariposa Grove in 1861 just as the Civil War was beginning. His photographs of Yosemite were exhibited in New York for the first time in 1862, as news of the Union’s disastrous defeat at Fredericksburg was landing in newspapers and while the Matthew Brady Studio’s horrific photographs of Antietam were on view. Watkins’s work tied the West to Northern cultural traditions and played a key role in pledging the once-wavering West to Union. Watkins’s photographs helped shape America’s idea of the West, and helped make the West a full participant in the nation. His pictures of California, Oregon, and Nevada, as well as modern-day Washington, Utah, and Arizona, not only introduced entire landscapes to America but were important to the development of American business, finance, agriculture, government policy, and science. Watkins’s clients, customers, and friends were a veritable “who’s who” of America’s Gilded Age, and his connections with notable figures such as Collis P. Huntington, John and Jessie Benton Frémont, Eadweard Muybridge, Frederick Billings, John Muir, Albert Bierstadt, and Asa Gray reveal how the Gilded Age helped make today’s America. Drawing on recent scholarship and fresh archival discoveries, Tyler Green reveals how an artist didn’t just reflect his time, but acted as an agent of influence. This telling of Watkins’s story will fascinate anyone interested in American history; the West; and how art and artists impacted the development of American ideas, industry, landscape, conservation, and politics. "[a] fascinating and indispensable book." "...the more that Green reveals about this enigmatic figure the more you want to see. As Green does with the events of Watkins’ life, he builds a web of beauty and risk, of boom and bust, and of serenity and exploitation in and in between Watkins’ pictures. There are still plenty of shadows, but Green puts us in a better place to see into them." 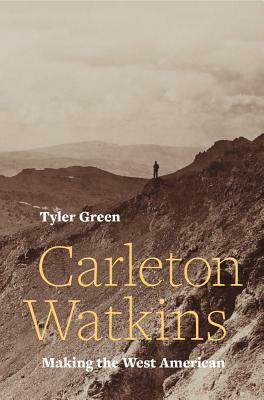 "...the book is convincing in its central argument, relating the sublimity of Watkins’s photography to American Transcendentalism, particularly the poetry of Emerson. It is also quite beautiful on the meanings of early Californian culture. In this sense Green’s research is not just about Watkins, but about the significance of the American West, and in some ways the definition of America itself. Ultimately, the book makes a strong case for photography as the first and most American art: much like Watkins’s work, Making the West American is at once technical and transcendent." "Carleton Watkins is a treasure of a book, which hopefully will bring more attention to this particular photographer’s work and achievement. With its numerous illustrations of photographs discussed by the author, in all likelihood a reader will come away with a deep sense of appreciation of both the artist in question but also his biographer." "Tyler Green’s marvellous biography of the gold rush photographer Carleton Watkins, who more or less created the image of America’s midwest, is all startling drama in both the life and art." "Green’s clearly written chronological narrative traces Watkins’s life and career. His inclusion of many of Watkins’s most notable photographs enriches the portrait of a photographer whose work left an indelible mark on an expanding country. This is a book to be appreciated both textually and visually."